Directa Plus, a producer and supplier of graphene-based products, has announced that Deewear, an Italy-based company focused on providing sportswear that combine design, technology and wearability, has launched D-ONE, a new generation of sportswear that combines the properties of Directa Plus’ Graphene Plus (G+) with the benefits of postural compress fabric, while offering superior comfort. 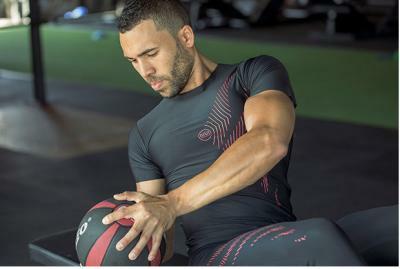 D-ONE consists of three high-performance technical layers: an inner layer coated in G+, an external layer of smart compress fabric and, in the advanced range, a middle layer that provides muscle articulation and postural support. The new collection includes short sleeve t-shirts and leggings, which are available in ‘Basic’ and ‘Advanced’ versions, in different sizes and as a male or female fit. The internal side of the fabric, which is in direct contact with the skin, is printed with G+, which provides D-ONE with thermal properties to regulate body temperature as well as offering anti-odor and bacteriostatic features and protection against ultraviolet rays. It achieves this without the use of any chemicals as Graphene Plus is natural, chemical-free and certified as non-toxic. The primary layer of D-ONE is the external ultra-light layer in smart compress fabric that has excellent aesthetic and technical features thanks to its innovative mesh of Nylon and Elastane combined to create a special open honeycomb structure. This allows for die cut and seamless production of external layer, providing extra comfort and a second-skin effect, breathability, freshness and hygiene. In the advanced versions of the garments, there is an additional layer that has been designed based on deep analysis of biomechanics to provide localized support and compressions to enhance circulation and postural support. Deewear launched an Indiegogo project to crowdfund this new graphene-enhanced sportswear line. The first shipments are expected around November 2017.